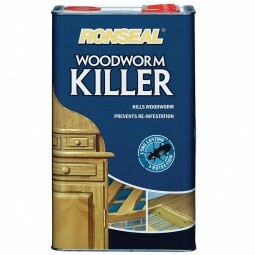 Ronseal Woodworm Killer is specially formulated to kill woodworm, their eggs and larvae. The liquid penetrates deep to provide years of protection against re-infestation. Once dry, the treated area can be over-coated. Ideal for curing wood worm on any timber surface. Approximately 4 metres - 8 metres² dependent on the type of substrate please refer to back of pack for specific guidance on application.